Do hamsters like to be petted? This might seem like a ridiculous question to the adoring hammie enthusiast, who might answer with a sardonic, “Do fish like water?” Surely the hamster, the ultimate in cuddly and affectionate animals, lives to be stroked, cuddled and otherwise petted by you, their adoring owner. And while this is mostly true, the fact is that hamsters—much like humans—only like to be touched at certain times, in specific ways and under certain conditions. 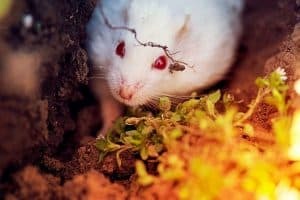 In this article, we will teach you as a devoted and loving hamster owner just how to handle your hammie; how to properly pet the pet who brings you so much joy and affection in return. The simple answer to the question, “Do hamsters like to be petted?” is yes, absolutely. Hamsters, like the vast majority of pets, crave and desire attention from their owners. And for both you and your hammie, a petting session can mean a time of great bonding and relaxation; those few precious moments each day that you get to spend quality time with your beloved pet. So yes, hamsters, in general, do like to be petted—yet not all the time, and not under all conditions. You also can master a certain, almost no-fail technique for the successful petting of a hamster. “Can’t we do anything in life these days without mastering some technique?” you might be wondering at this point, rolling your eyes heavenward. “Even pet our darned hamsters?” Point taken. 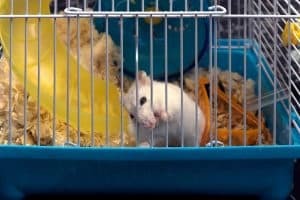 Yet surely as a concerned pet owner, you want to pet your hamster in a manner that is safe and healthy for them, and that will not in any way harm or frighten them. Or, to put it another way: Pet your hamster in accordance with our guidelines, and you can greatly reduce your immediate likelihood of being hissed at, scratched or bitten—need we say more? 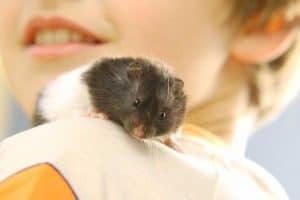 Read on now for the complete guide to petting your hamster, as it applies to virtually all species of hamsters, including Syrian, dwarf/Roborovski and Siberian. How Do I Pet My Hamster? • Cup your hamster in the cradle of your hand, placing your alternate hand on their back. • Run your middle and index fingers down the surface of the hamster’s back. • Pet the hamster with light, delicate strokes. • Avoid pressing down hard into the hamster’s fur or making sudden, jerky or swift moves. • Watch for any signs that your hamster is happy, relaxed, and enjoying the petting session. What are these signs, you inquire? Ah, we are so glad you asked…. How Do I Know My Hamster Likes Being Petted? If your hamster reacts the same way to a pet as they do to a treat, chirping and squeaking to their heart’s content, then chances are you’re doing something right! Much like a contented cat, a hamster who enjoys being petted might narrow or close their eyes, tweak their nose, or wiggle their ears in a show of sheer elation. A well-petted hamster may lay and nestle deep in the palm of your hand; thus facilitating further petting and cuddling their thanks for your tender and well-administered affections. Lulled by your stroking motions, your hamster may fall right to sleep in your hand. How Should I Pet a New Hamster? Everything is new to the novice hamster owner. From the moment that you bring home your little bundle of furry joy, you no doubt are confronted with endless questions regarding their care. How do you feed your hamster? How do you clean him/her? And how do you pet him/her? As a matter of fact, you may want to refrain from petting your hamster for the first few days of their presence in your home. Give them time to adapt to their surroundings before you make physical contact with them. Then, when you finally proceed to pet them, do so slowly and with great care. Yep, we have a step by step procedure for that too. Are you surprised? Start with short, light pats. As you feed or play with your hamster, you might lightly and gently pat his/her back; monitoring their reaction to this gesture. Refrain from any sudden or jerky moves. If you move too quickly or at harsh angles, you might frighten your hamster. Watch for any signs that your hamster is comfortable with the petting process, as outlined above. Similarly, also monitor your hamster for any signs that they are not pleased with being petted—not yet, anyway. What are these signs? Again, we are so glad you asked! How Can You Tell If Your Hamster Doesn’t Like to Be Petted? Just as your hamster cannot tell you that they quite favor your petting technique, they also can’t relate the opposite sentiment; that they would quite like you to quit and cut out all that infernal petting! Luckily, though, your hamster does have his/her own special ways of telling you to ixnay on the pet-nay. Hissing and sharp, repetitive squeaking. These are the sounds that hamsters generally make to express their fear, anger or dissatisfaction. If your hamster hisses or squeaks repeatedly while you are petting him/her, then cease all contact immediately. Squirming or running. If your hamster tries in some way to escape your grasp, then he/she may have a true aversion to petting. How Can I Persuade My Hamster to Like Petting? Holding your hammie. If you first hold your hamster in the palm of your hand, allowing them to explore and grow accustomed to your grasp, then they might become more amenable to the concept of petting. Patting before petting. Try gracing your hamster’s head with an occasional pat, before progressing to longer pets. Treats. Those who pet and treat simultaneously stand the best chance at success in this area! If your hamster simply does not like to be petted, then you have many other ways to show them your love: speaking sweetly to them, giving them toys and treats, etc. Yet if you would like to make your precious hammie into a verified ‘lap hamster,’ then please learn the right way to pet your pet!